To get on with showing you my picks for the best gifts for men in 2018. 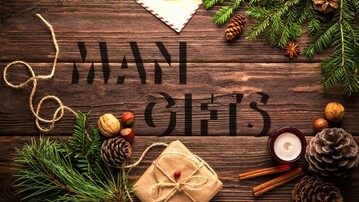 Note: Man gift prices are shown as they were at printing. Prices are subject to change. Team pride shines - and free-floats, and spins! - with these NFL and NCAA Football Hover Helmets. The 1/2 scale replica football collectibles have magnets in their upper and lower bases to create the electromagnetic force needed to levitate the helmets and, after a slight nudge, start them spinning, slowly and continuously. To further highlight their stunning visuals, Hover Helmets have LED lighting in the base that shines upward and sets them aglow through a pattern of spotlight holes. The effect is subtle enough to use as a nightlight in a kiddo's bedroom, but still communicates enough reverence use a Hover Helmet as the centerpiece of your good luck shrine to your favorite football team. Sony is releasing its mini rerelease of the PlayStation Classic Console on December 3, 2018. It will come with 20 preloaded games, including Final Fantasy Vll, Jumping Flash, Ridge Racer Type 4, Tekken 3, and Wild Arms. Like the NES Classic, the PlayStation Classic will be about 45% smaller than the original console. Marc Liss hand makes his Japanese kiridashi pocket knives, or dashis, from recycled files. He says, amongst knife makers, files are considered to be forged from some of the best steel there is, often 1095 or W1. So in revamping the old into the shiny new Liss has created a nod to a traditional Japanese design that should be as useful and practical as it is mighty nice to look at. Mighty nice indeed. Blue Fox Furnishings turns your classic indoor mini slam jam basketball hoops into rustic wood backboards with steel rims and design-y flourishes that make them look like an actual piece of home decor. Instead of an eyesore your wife begrudgingly let you put up over the door to your office, and complains is going to scratch the paint off the jamb every time she sees it. The wood basketball hoops are built with 100% sustainably forested lumber and a 9" rim and net optionally painted / dyed to make the hoop look less like a sporting good installed in your living room. This cylindrical HF1 furnace runs on propane and is sized for any artisan or hobbyist's small projects - from knives and tools to jewelry. Hell's Forge says its oval interior provides "ideal exposure to the flame's 'sweet spot'," and they include a 1" high density ceramic fiber blanket and full size thick firebrick to further aid the forge in reaching temperatures of up to 2300 degrees. The Hell's Forge HF1 can help in the molding of almost any metal, including gold, copper, silver, brass, bronze, aluminum, magnesium, alloys, tin, stainless steel, steel, or lead. It's small size facilitates quick setup, and heat times of 5 minutes or less. Whether you're in the mood for gaming, getting in on the cinematic action, or just lying back and relaxing, Moon endeavors to pilot you to the core of the experience you seek. Creator Royole is a human-machine interface tech firm founded by a group of Stanford engineering grads in 2012. Their goal with Moon was to "to create a brand new 3D mobile theater from the ground up," one with enhanced hi-res displays, noise-cancelling headphones, a more compact design, and a specially designed operating system for connecting users to unlimited movies and music. Pocket knife: check. Keychain light: check. 3-piece suit: check. EDC complete. The Compact Suit Folder condenses a full suit - jacket, pants, and tie - into a flat-packed tote about the size of a portfolio. Use it in lieu of a bulk garment or suit bag when traveling, especially on quick business trips, or if you're restricted to carry-on luggage only. A summer breeze on an open road might make you feel fine, but good luck feeling it from the neck up from behind the protective shield of your motorcycle helmet. Safety first, though, and since Feher can't reduce your helmet's face and head coverage without compromising ECE certification, they made the ACH-1 to bring the cool air inside. The Feher ACH-1 is the world's first self-contained air-conditioned motorcycle helmet. Inside a Bogota, Colombia design studio that looks as clean and modern as the leather goods that come out of it, Capra Leather handcrafts a full range of EDC and lifestyle leather goods, including collections of bags, hand-stitched laptop, phone, and tablet cases, and home and office accessories. Protect your family. Protect your friends. Protect your whiskey. The Whisky Vault (we'll agree to disagree on whether or not the word is better with an "e") is for the most serious of whisk(e)y collectors. Those who feel that with great liquor comes great responsibility, and if you're going to collect it, you better protect it. NoSweat Hat Liners are thin, lightweight, absorbent pads that stick on to hats, caps, or helmets to soak up forehead sweat so it doesn't run into your eyes. The liners also help prevent headwear staining and odor buildup. This Lightsaber Willy Warmer might be the finest expression of Grandmas's yarn I ever saw. Not a bad tribute to Star Wars either, presuming you've mastered The Force well enough to wield this saber once it's fired up. Better ditch the Uh-huh! and Oh baby! and start practicing your Swish! and Buzz! Do you hear the rumble in the Zungle? It's the V2 Viper sunglasses' built-in Vibra bone conduction speakers, sending sound from the arms hooked over your ears, through your face bones, and into to your drums o' hearing inside. The Zungle V2 Viper Sunglasses connect to any Bluetooth 5.0-compatible device up to 30' away to make music to your ears without plugging them up with earbuds or headphones. You can also use your sunglasses to make calls and connect to AI assistants Siri, Google, and Bixby. Solo Stove believes their Bonfire firepit "pushes the limits of both combustion airflow efficiency and minimalist outdoor design." Use it simply, safely, and beautifully on camping trips, tailgates, or in a backyard not big enough to take on a permanent pit installation. As much as women may dislike receiving electronics as gifts, men go cuckoo for digi-puffs. Which is why women always end up with headphones and activity trackers when they really want sparkly rings and leather handbags, and men end up with aftershave and wallets when they really want 4K Smart OLED TVs. This 2018 release from LG comes in 55" and 65", and with more trimmin's than your Thanksgiving turkey and Christmas tree combined. Maybe most notably, the B8 $k Smart OLED TV has AI ThinQ, meaning Google Assistant comes built in so you can use the LG Magic Remote to control all of your compatible smart devices with voice command. The TV is also Alexa compatible. Corkcicle's take on the booze glass with built-in cigar holder goes old-fashioned. Double old-fashioned, to be exact. The tumbler is a thick-bottomed double old-fashioned whiskey glass with a cutout midway up one side you can use as a cigar rest. What a great gift for a man with both a drinking and a smoking problem! And, if Corkcicle's photo shoot is any indication, a gambling problem too!